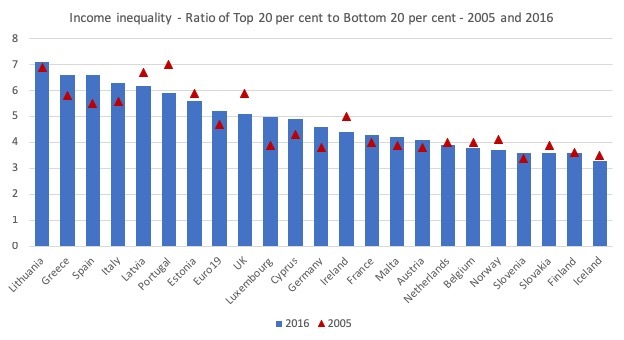 The following graph shows the Eurostat data (tessi180) for the quintile share ratio (the ratio of the top 20 per cent of the population with the highest income to the bottom 20 per cent). The most recent data for all the countries shown is for 2016 and there are clearly wide inequalities in the distribution of income across these European (mostly Eurozone nations). So in Lithuania the top 20 quintile receives 7.1 times the income compared to the income received by the bottom quintile. In Iceland the difference is 3.3 times only. The other point to note is that in most cases, income inequality has worsened over the period since 2005. Especially in the Eurozone countries. Poul Thomsen is the head of the IMFs European Department “and Greece’s original bailout architect”. As a reminder of what this character gets up to (and is responsible for but never brought to account), we go back to 2016. On April 2, 2016, WikiLeaks released a new document – 19 March 2016 IMF Teleconference on Greece – that detailed the “Transcript of an Audio Recording of an internal IMF meeting” held on March 19, 2016 in Athens to discuss the next tranche of bailout assistance from the Troika. The officials were Poul Thomsen, the head of the IMF’s European Department, Delia Velkouleskou, the IMF Mission Chief for Greece, and Iva Petrova from the IMF. Thomsen is still doing this job. They essentially need to agree to make OUR targets the baseline … Instead of waiting for them … I am not going accept a package of small measures. I am not. The bullying tone was clearly evident in the conversation. What is going to bring it all to a decision point? In the past there has been only one time when the decision has been made and then that was when they were about to run out of money seriously and to default. Right? But that is not an event. That is not going to cause them to … That discussion can go on for a long time. And they are just leading them down the road … why are they leading them down the road? Because they are not close to the event, whatever it is. I covered that IMF meeting in more detail in this blog post – The destruction of Greece – “only a down payment” according to the IMF (April 27, 2017). That is the reality of the IMF – it is a sordid institution and thinks nothing of advocating policy structures that force poor nations facing non-government spending collapses to cut government spending with the obvious result that unemployment and poverty and all the rest of it will rise. The Policy Note cited in the Introduction carries on this tradition. It is amazing that the Europhile Left still thinks that meaningful reforms are afoot. They are either naive or stupid or both. The topic of Thomsen’s latest intervention was the IMF’s position of the creation of a “Financial Union for the Euro Area” which is related to the interminable discussions about “how much more deepening of the economic and monetary union is needed”. As visions go this needs some serious work at the optometrist! Thomsen is “not talking about Treaty change” and proposes the ubiquitous “small steps”, which is the signature move in Europe small steps to nowhere! … end-goals for a more-complete economic and monetary union. 1. “a euro area architecture equipped with a full complement of public and private risk-sharing mechanisms”. And then we revert back to norm. Risk-sharing, according the IMF, is all about “individual responsibility” – which means that Member states have to do more on the “fiscal adjustments and structural reforms”. … not prevent some countries from being forced to undertake large pro-cyclical fiscal adjustments when the next shock or major downturn hits. In other words, the structure of the Eurozone in the long-term that the IMF aspires to maintains the requirments that when a nation is hit with a significant non-government spending decline its government will have to exacerbate that decline by introducing pro-cyclical fiscal adjustments. It is critical that all member countries respect the Stability and Growth Pact. It is critical that our friends in the European Commission enforce these rules consistently. Every club needs rules to thrive. Yes, steps are needed to simplify the SGP, but these must be matched by steps to ensure better compliance and stricter enforcement. That is the essence of it. Suggesting that the SGP and related rules (Fiscal Compact, etc) are the key to allow Member States to “thrive” is contrary to the evidence. The rules of this club have created divergence in outcomes, increased inequality, increased poverty rates, more jobless, young adults who entered the NEET status as teenagers and have never come back out, and more. The rules have ravages social protections. Seen major public assets sold off for peanuts. Seen wages growth flatten to nothing. Why would any Member State want to join or be part of this club? He went on to wax lyrical about the IMF’s suggestion for a federal fiscal capacity which was outlined in this Staff Discussion Note No 18/03 (March 26, 2018) – A Central Fiscal Stabilization Capacity for the Euro Area. There is not much to be excited about in that proposal. 2. “To ensure fiscal discipline and avoid moral hazard problems, the CFC would require strict adherence to the fiscal rules” – so a nation could not get support in a major downturn unless it had already been applying the austerity bias. 3. “The CFC would … not generate permanent transfers … requiring a country that receives transfers from the CFC in bad times to pay a “usage premium” on the cumulative transfers once its economy has recovered” – so nations that are more vulnerable to economic crisis would be forced to pay more into the fund in advance. In other words, this is not a functioning federal fiscal transfer. It is a forced contributory scheme that would restrict what a national government could do to support public well-being during good times and restrict the support it could receive from the fund in bad times. It would not alter the pro-cyclical austerity bias that characterises the monetary union framework. … improve compliance with the fiscal rules. But, interestingly, he is candid about the IMFs hopes that the European Commission will introduce meaningful reform. … it appears that major, pathbreaking initiatives are not likely any time soon. His proposals to get some small steps agreed focus on the changes to financial markets and banking, in particular. I wrote about these steps towards a single banking union in this blog post – Single banking union doomed to fail (December 18, 2013) – and I haven’t changed my view since. This analysis from my co-author Thomas Fazi – The EU’s banking union: a recipe for disaster (February 4, 2016) – also remains valid. The IMF is now arguing that the way Member States have responded to these (dysfunctional – my word) European Commission developments has held back the “free flow of capital and liquidity across borders”. He is referring to a concept he calls “ring-fencing”, which is the way the Member States have attempted to protect depositors in the face of their own lack of currency sovereignty. The idea is that a bank will create a protective arm that will ensure the depositors are not subject to the risks of other more speculative aspects of the bank’s activities. So broadly splitting deposit-taking banks from investment banks. This does not necessarily mean the legal structure of the bank has to be split. The European Commission is opposed to ring-fencing as you would expect from a neoliberal, corporatist institution. … that countries do not yet fully trust the new supervisory and resolution arrangements, despite all the progress made … national authorities seek to protect their economies and their taxpayers by ensuring that banks maintain sufficient capital and liquidity within their own jurisdictions. The problem, however, is that such defensive measures also tend to limit the free flow of capital and liquidity across borders, and thus act as barriers to a fully integrated banking union. So for those who want to privilege capital over national sovereignty, ‘ring-fencing’ is a bad trend. But, while Thomsen is not direct enough to admit it, the reality, is that the Member States do not believe that the European Commission’s changes will work and so they are doing what they can, within the highly restricted environment they now operate within, to protect their own systems. That doesn’t sound like “all the progress” at all. … it leaves large banking groups asking why they must pay large sums as resolution levies to the Single Resolution Fund, yet still not enjoy some of the fruits that the new banking union was supposed to bring. So the financial institutions also do not consider the ‘reforms’ have delivered anything worthwhile. The point is that the SSM and the SRM are separate funds and in stark contrast to a single resolution fund at the federal level. Germany opposed the creation of the latter because it believes it would get lumbered with disproportionate funding requests in times of crises. The point is that as the Member States use a foreign currency (the Euro), they are not in a position to ensure that the depositors in the banks within their borders can be protected. They cannot guarantee their own debt much less any other liabilities. The only way that the bank depositors can be fully protected and the banking system rendered stable is if the ECB is given a true “lender of last resort capacity” and a federal insurance fund be set up to cope with bank failure. The Germans are resolutely against anything like that. In his Policy Note, Thomsen proposed to force Member States to abandon ‘ring-fencing’ by giving the ECB more supervisory power. Of course, he knows that there will be “inevitable resistance from national” governments, primarily because they know that it means they become more powerless than they already are. Member States realise that the eurozone is not working, and, while they are not prepared to abandon the common currency, they are resistant to further dimininuition of their own capacity. … bail-ins … become the norm, and bail-outs the systemic exception. At present, with Member State governments responsible for bail-outs despite having no fundamental capacity to provide for them, the strategy, post-GFC, has become highly risk averse. Ring-fencing is a reflection of that. Thomsen thinks that “undercapitalization can be remedied by equity write-downs and debt-equity conversions without burning senior unsecured debt or uninsured deposits” and that support can also come from the SRF. Germany will never allow a “large and automatic … backstop” to the SRF to be introduced. It goes against everything they have argued for over many years. Despite the European Commission proposing the creation of a European deposit insurance scheme (EDIS) in November 2015, not much progress has been made. There is massive German resistance to such a scheme. … induce irresponsible risk-taking on the part of banks. It would enable even the euro zone’s zombie banks to obtain savings deposits at will and use them to finance trash ventures worldwide. … no banking regulator will be able to prevent excessive risk-taking once a deposit insurance has been established. The banks won’t behave much differently from the states that failed to adhere to their debt limits after the ECB reduced interest-rate spreads by means of its program of so-called outright monetary transactions. The articles argues for a system where the banks themselves “form mutually supportive groups” within Member States to avoide a dangerous “single, one-size-fits-all solution” such as EDIS. It concludes that EDIS would represent “an attempt to fight Europe’s smoldering bank fires with gasoline”. That is the German position. And to hold out hope that it will change and EDIS will come to fruition is the stuff of dreams. The IMF is like the Europhile Left – they both dream away in denial of the realities that are before them. The Eurozone is a massive failure. The Member States know that but cannot see a way out of it. For many people, the euro is all they have ever known. So there is a sense of being imprisoned and adapting to that way of life – they don’t know any better. Prisoners often deliberately commit crimes once released in order to get back into the secure, yet oppressive life behind bars. I see the Eurozone Member States and the people within them a bit like that. But, also, the citizens have become deeply suspicious of the European institutions – ECB, European Commission – and their governments are adopting measures that are contrary to the stipulates of Brussels and Frankfurt as a consequence. To think there will be a single banking sector in Europe with a fully functional deposit insurance scheme operating any time soon (or later) is just a denial of these realities. The IMF has no business having a ‘vision’ for the EU as it is none of its business, except that it has no real business of its own any more so it has to make up business. It would be a joke were it not so serious. Thomsen is right that clubs need rules to thrive, but not all rules are alike in this respect. A tontine is a club rule that ensures that only the final survivor thrives. This would be a ridiculous rule to have, but Thomsen looks as though he could support even this kind of rule. Why the Germans reject giving the ECB a LLR capacity is hard to understand. After all, if it were set up correctly, it would be the ECB and not Germany that would be providing this capacity. The idea that banks would go off half-cocked may not be that absurd given the behavior of banks up to and even after the GFC, but surely measures could be taken to mitigate this possibility. Maybe the German leaders really believe that increasing the money supply is THE definition of inflation. That if the CEB is forced to create a bunch of euros to pay off depositors in a bunch of banks that this will CERTAINLY result in a reduction in the actual buying power of all the euros that are held by the German people. Steve, the ECB will only be indemnifying depositors whose banks have failed, assuming, reasonably it seems to me, that not every bank in Germany will fail at the same time. Of course, DB could fail at any time were its oxygen cut off for any reason. Its debt is greater than Germany’s GDP. This would be a problem for the bank’s creditors, but wouldn’t necessarily affect the general public, I would have thought. Germany will do whatever it takes to prevent DB from being allowed to fail, as it is a TBTF institution, and this might have a knock-on effect. But what if the ECB engages its FDIC powers in Latvia? How could they justify seeing this as a lowering of the purchasing power of the euro in the Eurozone as a whole, even were they to believe the mainstream narrative? I would have thought that Germany would be against assisting the Latvians in this way because they might see the Latvian situation as due to some kind of moral turpitude and, therefore, their fault. I saw where someone suggested this, I thought it was right on. Steve, thanks for mentioning this. I figured I wasn’t the only one who thought this might be part of the mix. I was surprised at the use of the term, turpitude, in your quote. All of it is intereting but 33 mins in is when the German banker starts talking and tells it as it is. How can you be surprised. I copied and pasted it into my reply. So, it was your word that I was quoting. Let’s first recognize that accounts at a true Central Bank are inherently risk-free and always liquid. Those accounts need no deposit insurance, do they? The question then is why may not everyone have simple debit/checking accounts at their Central Bank itself? Why must we have only a single (except for mere physical fiat) payment system – the one that must work through banks or not at all? Then how can banks make loans? You do realize that the banking industry will not like that idea. 2) As loan intermediaries between accounts at the Central Bank. But why should it if something like a Citizen’s Dividend were implemented to distribute new fiat equally as needed? If high interest rates so indicated? Steve, it was your Marshall Plan quote I was referring to. Indeed they do, but if the initial or subsequent recipients of bank loans can then deposit their money at the CB directly, then how do you balance the accounts of the lending banks after they have created the loans, ie on the liability side? Are you proposing they borrow from the CB to balance their books? As it is, I’m not really sure what is to be gained by your suggestion. There’s nothing inherently wrong with the current banking system, as long as it’s kept bowler hat boring, and high street banks are prohibited from indulging in any of their more recent exotic activities. Just like it is done between banks; the Central Bank would transfer fiat (aka “reserves” in the case of banks) from the accounts of banks at the Central Banks to the accounts of individuals, businesses, State and local governments, etc. at the Central Bank (and, of course, vice versa if desired). In case they can’t meet liabilities they accepted (e.g. from from other banks ) or created via lending? How could that be justified anymore with the existence of an additional but risk-free, always liquid payment system that anyone* could use via his/her accounts at the Central Bank itself? Thus leaving only truly voluntary depositors at the banks? That said, instant clearing at the Central Bank should preclude even the need for very short-term liquidity and isn’t that what a bank’s liquid capital is meant to cover anyway? *These should be FREE for individual citizens, up to a reasonable account size (e.g. $250,000), per the principle that all citizens have an inherent right to use their Nation’s fiat in safe, convenient, risk-free account form at the Treasury or Central Bank. The proper charging for foreigners, individual citizen accounts that exceed the limit, other citizen accounts, “the banks”, etc. should at least meet costs but might also be a target of Central Bank policy which could include negative interest rates as well. I know that Bill is teaching the principles of MMT in many places around the world, and hats off to him for the extraordinary time and effort he invests in this crucial work, often reported on in this blog. To add a positive note to a thread about a rather gloomy European situation, here’s an article that indicates that MMT seems to be making some headway in the US. Unfortunately, the MMT principles that facilitate the recommended program are not expressly acknowledged…unless, in another senior moment, I missed something in the article. It takes decades of lying by the wealthy and the powerful to achieve this type of brainwashing. Before replying I would like your view. I would have thought the state holds all the aces though the players mentioned could exert pressure. If you used more words maybe I could understand you better, and if I used more words maybe I would be better understood. Since I’m not sure of your point maybe I’ll offend you with this. If so, sorry. My point was that the Marshal Plan was necessary BECAUSE Germany started WWII. We [the US] gave Germany aid even though it was obvious that it was the primary cause of the mess that all of Europe was in in 1946. And now Germany is not willing to bail out the depositors in the banks of other nations when those depositors will have done little wrong. If anyone will do wrong it will be the loan officers of the banks that made bad loans. Those officers will be forced out as a result of the failure of the bank. I don’t see what the Germans are worried about. . . Well, maybe I do. Like I said here in other posts; Germany runs a trade surplus. Because world trade IS a ZERO SUM GAME some other nations must import more than they export. However, how can they do this year after year? Where do they get the money to do this? . . Germany is in total denial about this problem. There must be an equilibrium, where every nation imports as much as it exports. If there isn’t one then there will be a crisis sooner or later. But, Germany needs to export more than it imports. So, Germany needs some nations to import more than they export. But, this must some day see a day when they can’t pay any more. Then what? . . Also, Prof. Mark Blith says that the basis of the debt problem in Europe in 2008 was that banks in the rich nations of the EU [Ger., Fr., etc.] had bought old bonds of the poor nations (on the assumption that now they were in the EU their bonds were safe) because they still had a high interest rate from before they had joined the EU. So, any moral turpitude was done by the German bankers. When the GFC/2008 hit Greece [for example] could not borrow to pay the holders of the old bonds as they came due. When the ECB and IMF made loans to Greece the money didn’t go to Greece, it went to the German banks which had made bad bets on how safe those old Greek bonds really were. The bankers were bailed out and the cost was dumped on the Greek people. In the US the banks were bailed out with new dollars so the American people don’t feel any pain as a result. They feel pain from the crash but not the bail out. The same should have been done in Europe, it wasn’t. . . Now, as Bill has said, the costs are still being paid by the Greek people and they did little wrong, while the German bankers were made whole when they *had* made bad business decisions. It isn’t fair. Germany doesn’t see this, or says it doesn’t. The EU must by reformed by most of the members leaving. It is the ONLY way forward. Too bad the leaders of the effected nations can’t see this, YET. The person being quoted doesn’t understand the fundamental point – MMT is about what is out there already. A nation doesn’t move to MMT – it already operates a monetary system that MMT helps you understand. It is not a regime that we can shift to. It already is. Indeed they do, but if the initial or subsequent recipients of bank loans can then deposit their money at the CB directly, then how do you balance the accounts of the lending banks after they have created the loans …? … There’s nothing inherently wrong with the current banking system, as long as it’s kept bowler hat boring”. Well that’s a value-judgment of course, and as such we must each be prepared to make our own. I know what mine is:- that what is most definitely wrong with the current system is that it has taken away (as to 97%-plus) the freedom that everyone used to have to decide whether to use the clearing-banks’ (privately-owned) payments system or not – because (during getting on for half my own lifetime) there was an alternative. It was called “cash”. Almost the entire working-class (and much of the bourgeoisie) chose not to use it:- wages (and salaries) were paid in cash; thereafter such cash as wasn’t immediately spent was paid-into a Post Office Savings Bank account, or a building society account, or to “the man from the Pru”, a local friendly society, or whatever (or else stuffed under the mattress). Many people saw no need – only inconvenience – in opening a bank deposit-account and having a cheque-book (the trade-mark of the would-be upwardly-mobile): face-to-face transactions were in cash and more distant ones by postal-order (really small ones by postage-stamps). In other European countries there was the Giro, serving the same purposes. Most or all those payment-media were free, and some of them were no less instantaneous than today’s digital transactions. Today there is no freedom *not* to have a private bank-account. Wages (other than “black” ones) are only ever paid electronically. As a consequence the private banks have acquired – or been presented with – an almost total monopoly over the payments system. I’ve seen it argued that they not only don’t make money out of that but that it might actually cost them something. For all I know that may be so but what it does give them instead is of inestimable value:- 1) a stranglehold on the nation’s windpipe, thus making them “too big to fail” which, 2) by reducing the risk-premium on the cost of finance to them boosts their profits (and their employees’ bonuses, ie personal wealth) – artificially – by up to hundreds of millions of pounds a year. Of course, re-creating that public utility a universally available, free or nearly so, payments system completely out of the grasp of the private banks – in the shape of personal accounts at the central bank – would deprive the latter of the use of a significant proportion of what now resides in demand-deposit accounts. If it’s true that it costs them to operate those and/or isn’t worth what little it brings in, then they ought to welcome that. Meanwhile it would loosen appreciably the stranglehold they currently exercise over all of the rest of us – to the great benefit of society as a whole. That is of course why they will fight it tooth and nail. Whatever is to society’s benefit must ipso facto be to the private banks’ – and their traders’, executives’ and owners’ – dis-benefit. Q.e.d. Steve, I don’t disagree with what you say. The US authorities wanted to avoid another Versailles. Rightly so in my view. Were DB to be allowed to fail, then ordinary depositors should be protected as well possibly as pension funds. I don’t care if hedge funds disappear for the most part. And bankers who diddled should be prosecuted. Unlike the trials after the Depression, hardlly anyone has been prosecuted for the crimes causing and following the GFC. Of course DB should not have been allowed to fail. It just should have been done in a way more like the US did it.That is to gift to Greece et all the euros they needed. . . The bonds in question were sold before the euro was created. That is before the new rules were put in place. Punishing retired people of Greece to save DB from itself is immoral. . . Greece can never repay those loans. Nations can only repay loans with income from exports being bigger than imports. And the powers that be made them accept foreign milk that is 10 days old as fresh instead of limiting ‘fresh milk’ to just 4 days old. That is intended to increase imports. Yes, some banker should have gone to jail. What the IMF has done is the textbook example of blackmailing. “… There’s nothing inherently wrong with the current banking system, as long as it’s kept bowler hat boring”. Here is some ones ‘value judgement’. Who is the “someone”, please (and what is this passage quoted from page 20 of)?